Comments: Thinking outside the 18 yard box, and faced with repetitive pie reviews, I have taken the radical action of reviewing a pie not from a football ground! Unbelievable Jeff! 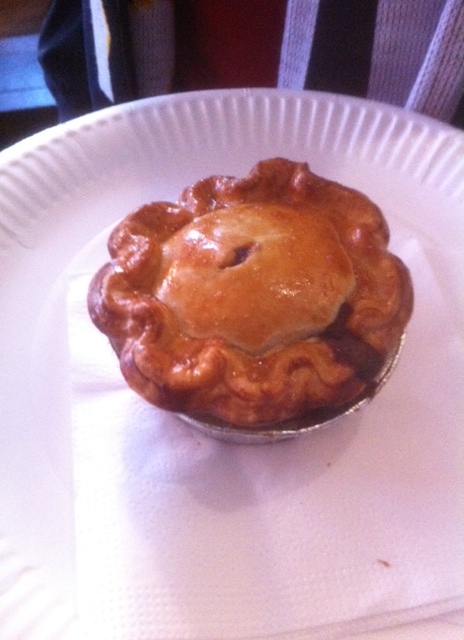 The first novelty inclusion is the pub the Duke’s Head in Putney, just across the river from Fulham’s cozy little ground of dashed hopes, and its mini pie from their special match day takeaway menu. Much like Fernando Torres this peppered steak pie is marred by its ludicrously inflated price tag, coming in at a transfer record busting £5.50 prevents this small and mighty bundle of pastry from ever making the grade. Obviously home made and delightfully tasty, proper, steak bits make this pie a tier above its generic Pukka/Hollands brand competitors, but the unnecessarily high price of such a small, and cold, snack fail to match the expected quality. A shame, but what did I expect when a pint is over £4 in there, who said football isn’t a working class sport any more?